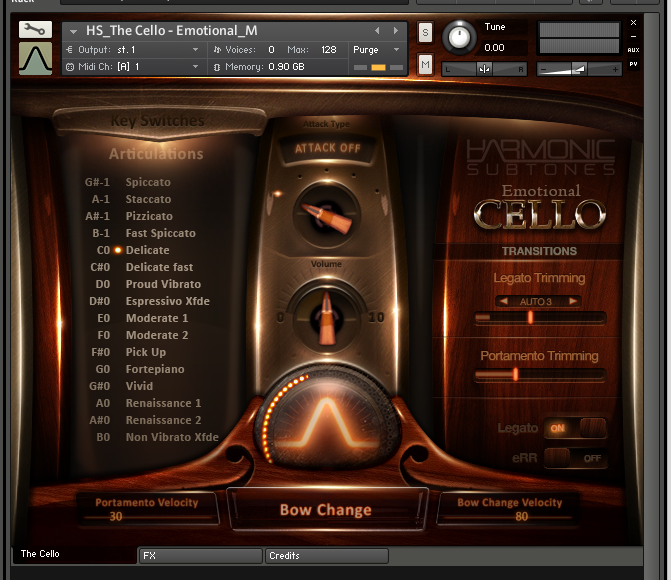 Emotional Cello – never before could you play a virtual instrument at this level of expression. 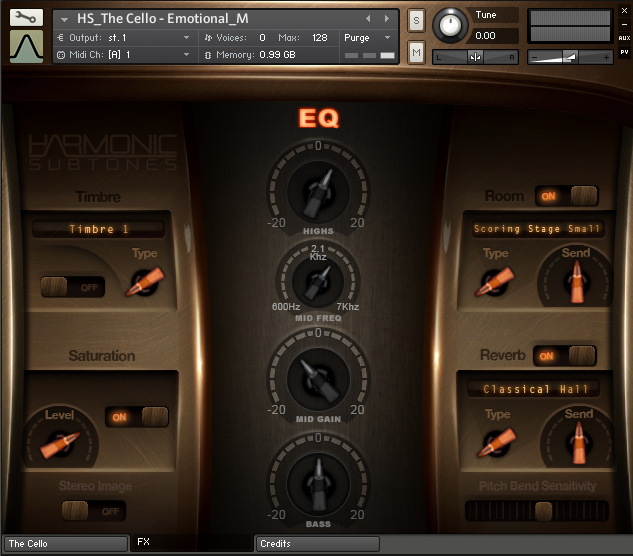 Emotional Cello is a new kind of virtual instrument, created by Harmonic Subtones, a Munich based developer team, for Native Instrument’s Kontakt 5 Player. Because of its powerful and yet exceptionally emotional sound, it unlocks previously unknown dimensions in the realms of sampling. Emotional Cello is the perfect instrument for film-scoring, pop-production, song-writing, classic and modern avant-garde cello compositions. This unique virtual instrument shines by its impressive number of articulations, its direct and uncolored sound quality, unusual play techniques and innovative rebowing. Harmonic Subtones calls the underlying philosophy of the Emotional Cello project „Contextual Sampling“. In search for perfect tone and highest inspiration, various string instruments were recorded over a period of no less than four years, realising that nothing can match the natural vibrato with its artistic facets performed by skilled musicians. Although any sample that includes recorded vibrato has obvious conceptual drawbacks, the sound of the performance itself will be a lot more inspirational than adding artificial vibrato. Based upon this insight, Harmonic Subtones went to extract the recordings with topmost musicality to forge a brilliantly sounding instrument. The result is a library of unmatched authenticity. To achieve conclusive arrangements, Emotional Cello offers a multitude of articulations. This way, the several phrases, turns, variations, pickups and endings can be used as real autonomous phrasings without ever being repetitive. To properly match the various sounds and articulations to your musical context, respective key-switches with appropriate naming, like delicate fast, vivid or moderate were added. Technical refinements were added, such as the rebowing-function which allows controlled directional change of the bow within a note using a key switch – highly useful for long sustains. Likewise, the vibrato-crossfade allows creating rhythmically perfect transitions from non-vibrato to vibrato-patches. Emotional Cello was recorded in the Mastermix Studio, Unterföhring/Germany. The instrument was carefully mic’ed in a wood-paneled room with high ceilings and highest possible wall distance. Microphone recordings were performed intentionally close using two Neumann models KM184 and U47, preserving a discreet portion of the room’s excellent acoustics. At the same time, the close mic’ing technique easily allows external processing, e.g. to accomplish an overall ambience for the mix. Use the integrated convolution reverb of the Kontakt 5 Player or the pure unprocessed original sounds as needed. Emotional offers three true legato master-patches: Normal, Sulponticello and Harmonics. These contain about 80% of all recorded articulations, which are logically interconnected using advanced scripting. For example: A note being played at the beginning will sound perfectly natural because the chosen sample will also be the first note of the source recordings. The same goes for legato- and sustained notes: All samples originate from a corresponding context of the original recordings. Each of the approximately 50 additional single-patches contains a selected articulation. Choices range from simple sustain-patches to dynamic crossfades between four layers. These patches are useful for producers who prefer to spread articulations on different MIDI tracks instead of toggeling between them via key switches. To achieve highest authenticity and liveliness, the patches offer four round-robin-samples for long notes and up to eight for short notes. Native Instruments Kontakt Player 5.5.0 required. You already own Emotional Violin and are overwhelmed by the variety of articulations and the direct and unadulterated sound? 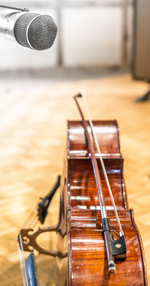 Well then the Emotional Cello Crossgrade is the right choice, be it for film scoring, pop music productions, songwriting, classical music or modern, avant-garde cello compositions. Kontakt Player legacy downloads – please check compatibility with your libraries! This product requires Native Access for installation, registration and activation. Start the Native Access-Software and log in using your Native Instruments credentials to start the setup.